I have been getting lots of questions from readers about control loops and loop stability, specially relative to switching power supplies. And now one of them asked outright that I write a web page about this matter. Of course, control loops are amply and widely discussed in electronic engineering books, but most of these books rely heavily on math, while most practical, hands-on electronicians seem to abhor math more strongly than nature abhors vacuum! So I will try to explain these matters in physical terms most people can visualize and understand. I will have to use some mathematical concepts, unfortunately, but far less than most textbooks do. It's all about having some device with an input and an output, which has a certain behaviour: Give it some input, and it will produce a specific output that depends on this input in some way. And then, take a sample of that output, compare it to what you want that device to do, and calculate just the exact right input needed to force that device to produce exactly the output you want. As simple as that. Not simple enough? Well, look around you! The world is full of control loops! For example, look at a car moving down the highway. The car and its dynamic behavior is such a device. The input is the position of the steering wheel, while the output is the direction the car actually goes. The transfer function from input to output is a complicate one, not linear at all! It may be close to linear while the car is moving slowly, without any wind. It will turn to whatever side the steering wheel is turned. But when there is some side wind, the car will tend to move sideways with the wind, and the steering wheel needs to be turned slightly just to keep the car going straight! The same happens when the road isn't perfectly level. When you drive over gravel roads, the tires tend to slip significantly, and you need more rotation of the steering wheel to produce a certain change of travel direction. And as the car goes faster, things get really weird! In a turn at high speed, the car might follow the steering wheel input up to a certain amount of rotation, and then suddenly the tires lose grip, and the car simply stops following steering wheel input! At that point, a totally different strategy is needed to recover control, like moving the steering wheel in the opposite direction, until control is re-gained , and then moving it more moderately. With the above, it's clear that to make a car go straight, it isn't sufficient to tie the steering wheel in a fixed position. Instead, some feedback is needed, that closes the loop. This feedback usually these days is still a human being, sitting behind that steering wheel. It senses what the car is doing, mainly through its eyes, but an experienced driver also feels what the car is doing, through, well, the part of his body he is sitting on. He processes all the information, and constantly makes little corrections to the steering wheel position. If this human feedback system is working properly, the car stays well centered on the lane, and follows all turns. If the human feedback system is still in the learning phase, and thus is too slow in processing the sensed information, the car will likely go in slalom lines, but still stay on the road, hopefully. And if the human feedback system is processing the information far slower than normal, for example because of having ingested a bottle of vodka, the usual outcome is that the car ends up off the road, against a tree, lightpole, or stuck in a building. This teaches you that control loops need to be fast enough for the process they are controlling. Remember this. As a circuit designer, your task is designing control loops that don't behave like they have drunk vodka. Or at least not an entire bottle! In electronics, control loops are everywhere. Every audio amplifier that uses negative feedback has such a control loop. Regulated power supplies are important examples, as are the position control systems for a robot, the autopilot of an aircraft, or the trajectory control system of a rocket launching a satellite into a precise orbit. A PLL is basically a beautiful control loop, regardless of whether we are talking about a simple PLL to decode an FM signal, or a PLL frequency synthesizer. Industrial process controllers are basically control loops on steroids, while a humble operational amplifier is normally also operated that way. We have an oscillator that runs at 50kHz, feeding a Pulse Width Modulator, which produces a 50kHz square wave output with a duty cycle proportional to the input voltage. This wave is used to control a power MOSFET, through a driver circuit. The MOSFET switches on and off, applying 20V from the primary supply to the ouput filter when it is on, and leaving that output filter floating when it is off. Up to this point the behavior is simple. But what the filter does is not very simple at all! To simplify it, for a first approach, I will assume that the load resistance is inside the range that will result in continuous mode operation. This means that the current in the inductor never completely stops, but only fluctuates. Further down I will add what happens when this is not the case. Whenever the MOSFET is off, the inductor current can only flow through the diode. So, in continuous mode the voltage at the node of the MOSFET, inductor and diode will be about -0.7V (one diode drop) whenever the MOSFET is off, and of course it will be very close to 20V when the MOSFET is on. This gives us a square wave at this junction, that has the same duty cycle as the one coming from the PWM, only at other voltage levels. If you look at this variable duty cycle square wave on a spectrum analyzer, you will see that it has (of course!) strong contents at 50kHz and its harmonics, but also has a DC component and lower frequencies. The DC and low frequencies present are an amplified copy of the signal presented to the PWM's input! - It passes DC and low frequency components, while increasingly attenuating higher ones. Normally it's designed for a cut-off frequency much lower than the oscillator frequency, at least in a 1:10 ratio. So it will block the 50kHz signals reasonably well, and its harmonics even better, while passing the amplified copy of the PWM's input signal to the output. - It will affect the phase of all AC components passing through it. While the effect on low frequency components is very small, even negligible, the effect on high frequencies (50kHz, for example) is dramatic, approaching a complete phase reversal! That means, simply, that while the MOSFET is switching on, and the voltage at the input of the filter is going up, the voltage at the filter's output will be going down! Such a pair of graphs is called a Bode plot. To design control loops, you need to understand Bode plots, think in Bode plots, sweat Bode plots, even dream of Bode plots! So, let's start understanding this one. It's about a low pass filter having a cutoff frequency slightly above 1kHz, and loaded by resistor of a moderate value, like an actual power supply might work. I only cheated a little bit, and simulated perfect components, rather than the real-world, lossy components we can buy! More about that later. As you can see, at low frequencies up to a few hundred Hertz this filter does essentially nothing: The gain is zero dB, and the phase shift is essentially zero too, meaning that the output of the filter is identical to the input. That's entirely logical, considering that the reactance of the inductor is negligibly small at these frequencies, so that it essentially short-circuits the output to the input. But as we approach the resonant frequency, things take a rather dramatic turn: The filter starts showing some voltage gain, up to about 17dB in this case, at its exact resonance. In the same frequency range around resonance, the phase of the output changes dramatically, reaching 90° phase lag at the exact resonant frequency, and then approaching 180° lag at only slightly higher frequencies. At even higher frequencies, well above the filter's resonance, we get a steady behavior again, with a constant 180° phase lag, and a negative "gain", or rather an attenuation, that grows at a steady rate of 40dB per frequency decade. Why precisely 40dB per decade? This number, that looks like cookbook material, really comes from a very simple fact: The reactance of an inductor rises proportionally to the frequency, while the reactance of a capacitor falls in inverse proportion to it. So, if we increase the frequency tenfold, the inductor passes only 1/10th as much current, and with the capacitor having only 1/10th its previous reactance, it causes just 1/100th of the original voltage drop. As a result, for ten times higher frequency, there is a hundred times less output. And a voltage ratio of 100 times happens to be 40dB. To turn the open-ended circuit shown above into a true loop, you have to take a sample from the output, and process it to obtain a suitable input signal that you can feed into the input. Designing the circuit that does this is the single most feared task many electronic designers have to face! The evil devil of loop instability, often leading to seemingly unstoppable self-oscillation, follows these poor fellows into their sweetest dreams, turning them into churning nightmares! The fundamental operation of this feedback system is simple: The 2k/1k voltage divider produces a sample of the output voltage, being one third as large in this case. For a 12V output, this would be 4V. A Zener diode is used to provide a 4V reference, and an op amp compares the reference to the output voltage sample, and hugely amplifies the difference between them. This amplified error signal is put into the PWM. And then we hold all thumbs that it will work! The idea is that if the output voltage gets a little too low, the op amp's output will get much higher, this will increase the pulse width, thus raising the output voltage and correcting the error. But it won't work. At least not very well! Most likely the entire loop will self-oscillate in a horrible way! Let's see why. - If there is any frequency at which the total loop gain is exactly unity (0dB), and the total phase shift around the loop is exactly zero, or 360°, or any multiple of that, the circuit will be unstable. That means it will oscillate. - If the above is not the case, but there is any frequency at which the gain is higher than unity, and the phase shift is like above, then the circuit will be "conditionally stable". That means, it will not oscillate while these conditions are maintained. The problem is that any momentary saturation condition of any part of the loop reduces the average gain, so that in practice such a circuit will typically at least momentarily meet the conditions for instability, and will start oscillating. Once it starts oscillating, the oscillation by itself keeps driving the circuit into periodic saturation, self-adjusting the loop gain to that sweet value of unity, and thus maintaining the oscillation. So, for practical purposes, a "conditionally stable" loop is an unstable one. - If none of the above conditions are met, meaning that at each frequency either the gain is less than unity, or the phase shift is not 0°, 360°, nor any multiple of that, or both, the loop will be stable. So, to analyze whether our circuit is stable, we need to draw the Bode plot for the entire loop. This is easier said than done! We can start anywhere in the loop. 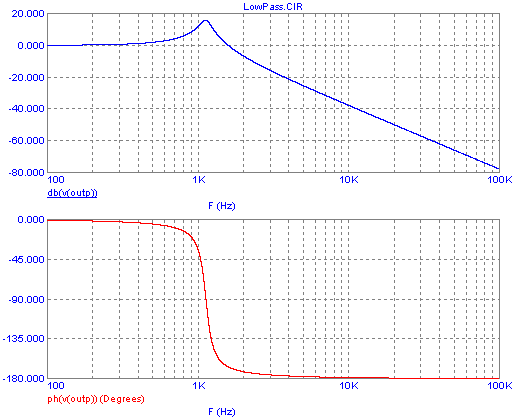 Since we already have a Bode plot for the low pass filter, let's start from there. The next element in the loop is the resistive divider. It doesn't affect the phase of any signals, and it divides everything by 3. That means a constant gain of -9.5dB at any frequency, and zero phase shift. That's a Bode plot so simple that I won't bother generating it. Combining this Bode plot to that of the low pass filter, the result is a new Bode plot for both sections, that looks just the same as the Bode plot for the filter, only that it has the entire gain curve shifted 9.5dB down. Several things stand out here: Its very high gain at very low frequencies; the almost uniform gain drop-off throughout the higher spectrum, at -20dB per decade; and its phase shift, which starts from -180° at very low frequencies, because I'm modeling an inverting amplifier, and then soon shifts by another 90°, completing that shift roughly by 1kHz! In the gain plot we can see two clearly distinct frequency ranges of operation: The very low frequencies up to about 100Hz, where the gain is very high and constant, and the higher frequency range above 100Hz, in which the gain drops at a steady 20dB per decade. Now if we take into account the phase plot too, we need to consider the op amp as having three distinct frequency ranges: The low range with constant high gain and constant -180° phase, up to 10Hz; the high range, with downsloping gain and constant -270° phase, from 1kHz up; and the transition range, from 10Hz to 1kHz, in which the gain changes rather briskly from flat to downsloping, while the phase changes much more gradually from -180° to -270°. These curves are typical for any op amp, although the very low frequency gain, and the transition frequency, depend on the specific op amp. Note that when talking about phase shift, 180° is the same as -180°, 90° is the same as -270°, and so on. You should also be warned that most other authors, when discussing these matters, don't mention the fact that error amplifiers are usually inverting amplifiers, and so they would talk about a phase shift changing from 0° to -90° in this case. It doesn't matter which method you use, as long as you are aware that in any negative feedback system, like control loops are, there is always a phase inversion, meaning that the reference of all things is a -180° phase shift! In the same breadth I should mention that most authors draw their Bode plots as straight lines with sharp corners, that approximate the actual softly curving lines.In my opinion, that's a dangerous practice, because the actual traces can deviate by several dB and tens of degrees from the straight line drawings, misleading a designer into making an unstable circuit! For this reason I'm using the actual, curvaceous traces in my Bode plots. They are more beautiful too! The output of our op amp goes to the PWM. We need to come up with a Bode plot for the entire cell consisting of this PWM, driver, and MOSFET. Assuming that we are using the PWM included in typical power supply control ICs, the input range to the PWM will be typically something like 1 to 3V, to produce an output from zero to 100% duty cycle (or close enough to that). The average voltage after the MOSFET will be this same percentage of the 20V input! So, at 20V input, and given the total 2V control range, this cell of our regulator has a voltage gain of 10, which is 20dB. This holds true from DC to the highest frequencies that still allow proper PWM operation, that is, frequencies that are much lower than out 50kHz clock oscillator. When our signal frequency comes into the same range of the clock frequency, better forget it, because all sorts of weird things happen! You might think, at first, that a PWM causes no phase lag. But... it does! The problem is of a statistical nature: Whenever the input voltage to the PWM changes, the PWM cannot transfer this change to the output any faster than the individual pulses happen. So, it causes an input-to-output delay that averages one half pulse, which would be 10µs in our example. At low frequencies a delay of 10µs means a negligible phase delay. For example at 100Hz a cycle takes 10ms, so a delay of 10µs is about one third of one degree phase lag. But at the higher frequencies the phase lag becomes progressively larger. It's not totally accurate because I was too lazy to model it in full, and what's more worrying, because this circuit simulator produces nonsensical output as soon as the DC gain exceeds 80dB! That forced me to tweak some things, resulting in a gain curve about 15dB lower than the real thing, but it's close enough for this crude analysis. The only facts you need to see right now are these: At low frequencies the loop has a very high gain, which is highly desirable to achieve a precise output voltage, and the phase shift is close enough to -180° so that we can consider this to be valid, true, negative feedback. But around 700Hz the phase lag quickly grows, and by the resonant frequency of the filter, around 1.2kHz, it reaches -360°! That means, in addition to the desired inverting action of the op amp, there is an additional, full 180° phase lag, coming from the low pass filter, making a total lag of 360°. Now remember the stability criteria: Where the phase lag is 0° (or 360°, or a multiple of that), the gain is not allowed to be 1 or higher. 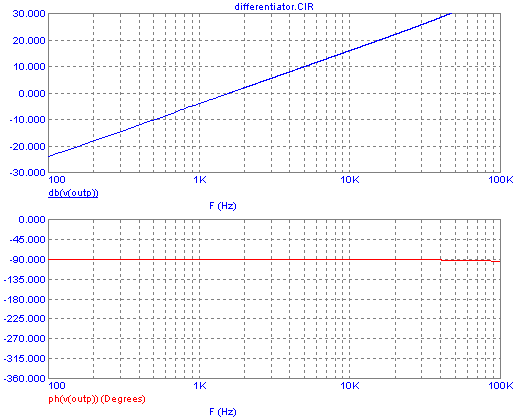 But our circuit has a whopping gain of over 80dB at this frequency! So it is "conditionally stable" only, which means that in practice it will be unstable! The actual behavior of this circuit would be that of a simple on/off controlled loop: At first the op amp would drive the PWM to 100% duty cycle, so that the MOSFET would be continuously on. The output voltage would rise at a rate determined by the low pass filter, and when it crosses the 12V barrier, the opamp would ramp down and drive the PWM into its zero duty cycle range. So the MOSFET would switch off for a long time, after having done only a few pulses of decreasing width at 50kHz. It would stay off for a long time, while the inductor keeps delivering current to the capacitor, and the output voltage keeps rising for a while, until running out of juice. At that time the voltage starts dropping, and when it crosses the 12V barrier again, downward, the op amp would ramp up again, the PWM would again go to 100% duty cycle, and so on. In short, the circuit would oscillate at the low pass filter's resonant frequency, and the 50kHz oscillator and PWM would be basically defeated! At the output we would get a 12V average voltage, so the circuit sort of works - but there would be a large 1.2kHz ripple on it! And the current in the coil and transistor would reach dangerous levels. All this would make the circuit unusable. What we have now is basically the filter's phase response up to several kilohertz, because the op amp has a pretty clean 180° phase inversion up to that frequency, at this low gain setting. The op amp's phase delay comes in only from 10kHz upwards, bending the phase curve down. That's good. 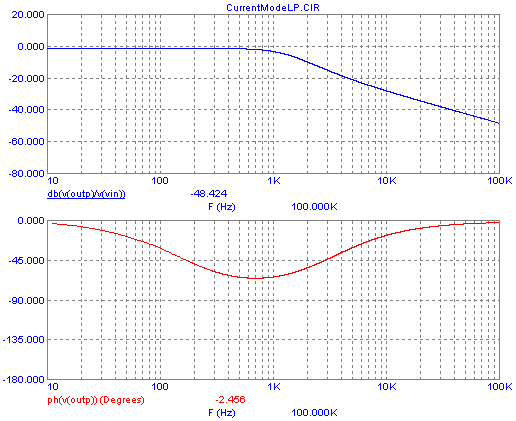 But we get a total loop gain at low frequencies that is only about 30dB. This is given by the 20dB gain of the PWM and power stage, the zero dB of the low pass filter, the almost 10dB attenuation of the resistive divider, and the 20dB gain of the op amp. This isn't a brilliant amount of low frequency gain to have! Any disturbance, for example 100Hz ripple riding on our 20V primary supply, will get through to the ouput, with only 30dB attenuation. That's poor performance! And even worse: At the frequency where the phase lag crosses zero, we still have several dB of gain, so the circuit would still be unstable!!! Of course we could achieve stability by brute force, simply by lowering the op amp gain enough. But by then we would have very little regulating action left, rendering the whole circuit pointless! It's pretty clear what we could use: High gain at low frequencies, but rolling off fast enough, along with a controlled phase behaviour, so that we meet the stability criteria while at the same time providing good regulation! To do this, we need to know just how low the gain needs to be, at the phase crossover frequency. This is where the concepts of phase margin and gain margin come in. Gain margin is simply how much the loop gain is below unity at the exact frequency where the phase response first crosses zero. And phase margin is how many degrees away from zero (or 360°, or -360°) the phase is, at the exact frequency where the gain is unity (0dB). The Bode plot above shows that the gain margin we obtain is about -13dB, since the gain is about +13dB at the phase zero crossing. And the phase margin in that plot is roughly -8°. Instead the values that usually are considered desirable are a phase margin of about 45 to 60°, and a gain margin of about 6 to 10dB. If a circuit operates under many different conditions, these criteria should be met at the worst of all operating conditions. Clearly we aren't there yet! Now it's about high time to learn, if you haven't yet done so, how an op amp behaves when you connect different stuff to it. Because we need this tool to shape the response of our error amplifier, to achive good regulation along with full stability. See how the same op amp that had such a crummy response when left without any feedback, now has a nice, very stable gain up to several kHz, and at the same time its phase delay gets significant only above 3kHz too! This is called a proportional amplifier, because it amplifies all frequencies by the same proportion, up to a limit given by the op amp's characteristics. Above that range, the op amp internally limits the frequency response and causes a phase lag. Note that what the resistive feedback does, relative to the bare bones op amp, is simply pushing down the gain in the flat response area, without changing the position of the sloping gain line. This moves the intersection of the two lines (or rather, the bend) up in the spectrum, and with it goes the 90° phase delay. For a given op amp, the lower the gain you program it for, the wider will be its flat gain, no-lag bandwidth. This circuit is called an integrator, because its output is the integral of its input. Put a voltage step in, and you get a ramp out. Put a square wave in, and you get a triangle wave out. Put a sine in, and you get a cosine out - or the other way around, I don't remember, being mathematically challenged myself... To non-mathematical electronicians, anyway, it's the same sine, shifted 90° back in phase. But such boring Bode plots, with very straight lines, are often the most useful! You can see that throughout the frequency range in which it functions as an integrator, it has a gain sloping down at a constant 20dB per decade, and a constant phase shift of -90° relative to the standard -180° of any inverting amplifier. The lower limit of this behavior is given by the finite DC gain of any op amp, which turns it into a proportional amplifier in the very low frequency range, tending to very high, constant gain there, and only the normal 180° shift. Just the beginning of this is visible in this plot, that starts from 100Hz. And the upper limit of the clean behavior is given by other internal effects of the op amp, adding an additional phase delay, but at frequencies far above than our range of interest. So, what the capacitive feedback does, relative to the bare-bones op amp, is basically shifting the sloping part of its gain curve down, without affecting the flat, low frequency line. This moves the intersection frequency down, out of the graph in this case. 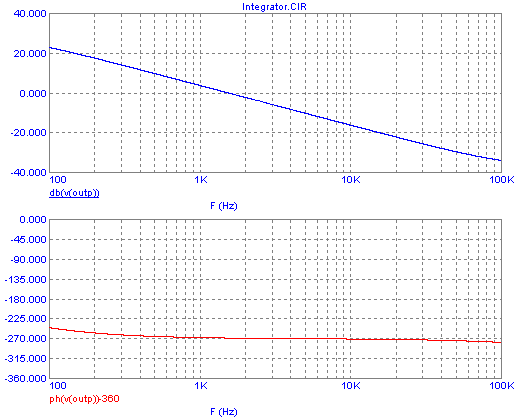 It's easy to make an integrator, with practical component values, that has an intersection frequency as low as 0.01Hz! 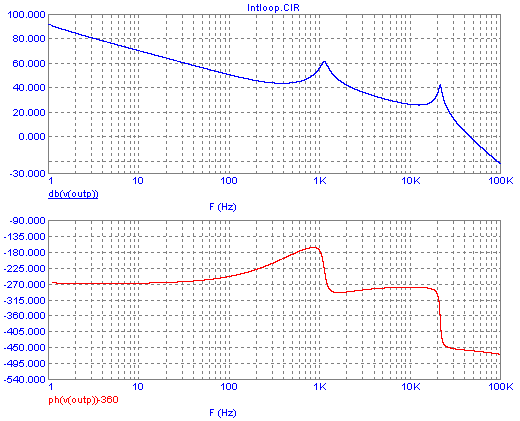 At DC, the gain of an integrator is always the op amp's open loop gain, typically 80 to 100dB. This is called a differentiator, because its output is the derivative of the input: A ramp on the input produces a step on the output, a triangle at the input gives a square at the output, and a cosine at the input gives a sine at the output - or the rounder way another, because I'm still mathematically challenged! Anyway, it shifts sine waves in the opposite direction as an integrator does. You can see the steadily rising gain, at 20dB per decade, until reaching a limit given by the op amp's characteristics. The phase shift is -90°, which is a positive shift of 90° relative to the -180° of any inverting amplifier. But the imperfections of a practical op amp, built in intentionally (and necessarily) in the form of a compensation capacitance, start causing an increasing phase lag from a few kHz up. Here we have a clean differentiator! Keep this in mind: When you are caring only about low frequencies, cheap op amps like the 741, 358, or 324 are fine. But when you need an op amp to perform cleanly at somewhat higher frequencies, be so good and pay a little more for a better one! The op amp used for the crooked differentiator is a 741, and some of the op amps inside power supply control ICs are even worse! Instead the one used for this last Bode plot is an LF400. The gain of the differentiator keeps decreasing toward lower frequencies, so that at DC it reaches infinite attenuation. That means its output doesn't react at all to any DC voltage at its input. At DC, both capacitors behave as open circuits, so that the amplifier has the op amp's full open loop gain. In the low frequency range, the reactance of the integrator capacitor is high relative to the proportional gain resistor, so it dominates the series pair. At the same time, the differentiator capacitance also has a high reactance compared to the reference resistor, so that in this parallel pair, the resistor dominates. The result is that in low frequency range the circuit operates as an integrator. In the middle frequency range, Cdiff's reactance is still large compared to Rref, but Cint's reactance has become small compared to Rprop. As a result, both resistors dominate, and the capacitors are ineffective. 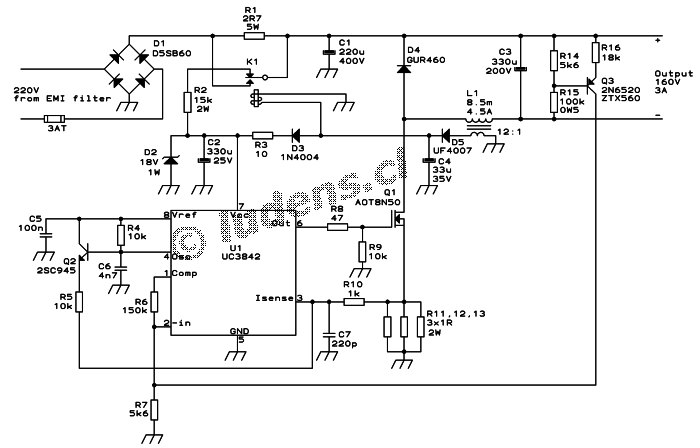 As a result, in this middle frequency range the circuit operates as a proportional amplifier. And in the high frequency range - you guessed it - both capacitors' reactances are small compared to their companion resistors, so that in the input parallel group the capacitor dominates, and in the feedback series group the resistor dominates. As a result, the circuit operates as an differentiator in this high frequency range. The whole affair is called a PID controller, and you will hear this buzzword mentioned very often in the context of control theory. PID, of course, stands for "proportional, integral, derivative". PID controllers are used very, very often. And I do mean that! Other authors call it a lag-lead circuit, because it offers phase lag in some frequency range, and phase lead in another. As you can see, in the low frequency range we have an integrating behavior, characterized by a -20dB/decade gain slope and a phase of -270°. In the middle frequency range we have a flat, low gain, the phase being nominally the -180° of any inverting amplifier. And in the high frequency range, the differentiator kicks in, with the gain sloping up at 20dB/decade, and the phase being 90° advanced relative to the -180° of the inverting amplifier, that is, -90°. This holds true up to a frequency where the performance of the specific op amp starts to fall apart. It's high time now to introduce two more of our friends, poles and zeroes. A "pole" is a fancy name given to bending the gain curve down, for example from flat to -20dB/decade, or from -20 to -40dB/ decade. Any pole also causes the phase to shift 90° more negative. A "zero" is an equally fancy name given to the opposite effect, that is, the gain curve bending up by a step of 20dB/decade, and the phase shifting 90° more positive. 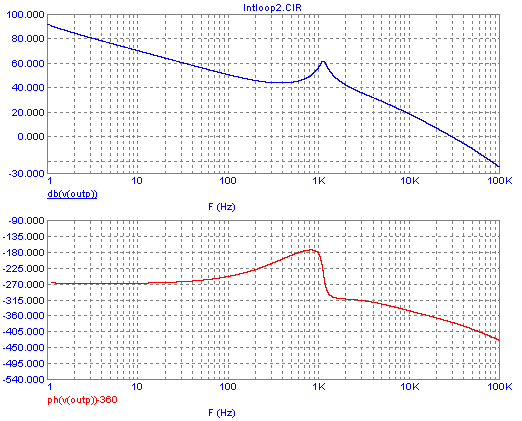 In the Bode plot above, we can see two zeroes, one located at 100Hz, the other at 10kHz. The circuit actually also has at least two poles, but they fall outside the frequency range of this plot. One happens at a very low frequency, where the integrator's gain curve intercepts the open loop gain of the op amp, probably around 80 or 90dB gain, and close to one tenth of a Hertz! The other one, for this op amp under these conditions, probably happens at a few hundred kHz. The very beginning of it is visible in the plotted phase curve. At the exact frequency of a pole or a zero, the gain is 3dB off the "straight line" value obtained by drawing best-fitting straights, and the phase shift is precisely 45° off the starting value. This can be seen very nicely in the plot above. The design of such a PID amplifier is pretty simple: You first pick a convenient value for the reference resistor. Then you calculate the proportional gain resistor to give it the proper mid-frequency gain. If you want a gain of ten (20dB), make it ten times as large as the reference resistor. Then you place the two zeroes. The lower one is placed by calculating the integrator capacitor value such that its reactance is equal to Rprop at the desired lower zero frequency, 100Hz in this case. Then you calculate the differentiator capacitance, such that its reactance is the same value as the Rref at the desired upper zero frequency, 10kHz in this case. Finally, if impractical or inconvenient component values result, you can scale all four values as you like, increasing the resistances in the same proportion you decrease the capacitances. Ready! But this time we will calculate the optimal value! And the logic goes like this: Since our feedback amplifier is an integrator, it will have -270° phase shift. So, at the frequency where the lowpass filter of the power section provides another -90° phase shift, the total phase shift will reach a full 360°, the condition for oscillation. At this frequency, which is the filter's resonant frequency of 1.2kHz, we need the total loop gain to be -6 to -10dB, to have adequate gain margin. We saw way up in this page that at this frequency the low pass filter has 17dB gain. The PWM and power stage, fed by 20V, provide 20dB gain. And the 2k/1k voltage divider provides nearly 10dB of attenuation. So we have slightly over 27dB of gain left, and we need -6dB or lower, which means that at 1.2kHz the error amplifier must provide -34dB of "gain". 34dB is a voltage ratio of 50, meaning that the integrator capacitor must have a reactance 50 times lower than the input resistance to the amplifier, at 1.2kHz. The effective input resistance, in this circuit, is given by the parallel equivalent of the 2k and 1k resistors. This is 667Ω. So, the capacitor needs to have a value of 10µF. If this value seems impractically high for a nonpolarized capacitor, of course the values can be scaled, for example you can use 1µF and replace the divider resistors by 20k and 10k. As you can see, at the frequency where the phase lag reaches 360°, the gain is -7dB, satisfying the gain margin requirement for stability. And where the gain becomes zero, at about 80Hz, the phase lag is 270°, so the phase margin is 90°, which is plenty. This means that the loop will be stable using this integrating error amplifier. But its low frequency gain is still poor! Quite a lot better than that of a stable solution based on a low gain proportional error amplifier, but still poor. For example, if there is 100Hz hum on our 20V primary supply, the low pass filter doesn't attenuate it at all, as it has 0dB gain there. And the error amplifier has about -2dB gain at that frequency, and the voltage divider has almost -10dB, so that the control circuit will do very little to reduce the 100Hz hum. It will pass right through to the output, making this a poor regulator! We need something better. And we need to think a little, what we can do to make it better. The problem is simple: The low pass filter provides good attenuation of any unwanted ripple, only well above its resonant frequency. So, at low and middle frequencies, through and somewhat beyond the resonant frequency, only the feedback circuit can be used to reduce any unwanted ripple, noise, and other crap. So, we absolutely need a sufficiently high gain in the error amplifier, through and beyond the resonant frequency of the filter! But the filter introduces a nasty, quite abrupt 180° phase change around its resonant frequency. This shift goes from 0° at low frequencies, to -180° at high ones. So, the best thing we can do, given that we can't eliminate the 180° phase change, is move it up, so that the total loop phase response, instead of being -180° to -360°, or worse yet, -270° to -540°, becomes -90° to -270°! That range accomodates the low pass filter's phase change, and it also satisfies the phase margin stability criteria, at any frequency! The tool for achieving this goal is giving the error amplifier a differentiating action, in the frequency range around the filter resonance, and up to the frequency where the gain has dropped well beyond unity. But we can't use a simple differentiator as an error amplifier, because its response at DC would be none at all! And at low frequencies it would be dismally low. So, we still need an integrator to get enough low frequency and DC gain, but then we introduce a zero, and another zero, both below the filter's resonant frequency. The first zero compensates for the integrator's phase shift, bringing the error amplifer's phase back up to -180°. And the second zero brings it further up to -90 degrees, so that the entire loop phase response would then start at -270°, move up to -180° and -90°, and then at the filter's resonance move down again to -270°. Given these phase shifts, we can give the error amplifer any gain we want, and still get stability! The only practical limit to gain is that at very high frequencies some additional phase lags appear, in the op amp and elsewhere, so at those frequencies the gain must be low enough to maintain stability. But at those high frequencies the low pass filter is highly effective, so we don't need any error amplifier gain there. Let's see how to implement this. Let me start by telling you that the two zeroes might be placed on different frequencies, or might be placed both on the same frequency! This actually gives the best low frequency gain, for a given very high frequency zero gain crossing. Let's try it, using our PID circuit. And let's try placing the zeroes on 500Hz, and see what happens. This should be low enough to have them give a good phase boost at 1200Hz, and at the same time high enough to avoid reducing the mid frequency gain too much. Also let's make an integrator that provides a gain of 40dB at 100Hz, to get reasonable ripple reduction. Taking our PID circuit, and using our 667Ω equivalent input resistance for Rref, we neet an integrator capacitor that has 66.7kΩ reactance at 100Hz, to give the 40dB of gain there. This is a value of 24nF. Then we place one of the zeroes, by means of Rprop, which needs to have the same value as Cint's reactance is at 500Hz. This is 13.3kΩ. And then we place the other zero at the same frequency. For that we need a Cdiff that has 667Ω reactance at 500Hz. This is 477nF. Here is a little quirk of my chosen voltage regulator circuit: Since I used the 2k/1k voltage divider as input resistance for the error amplifier, there isn't an obvious place to put Cdiff! So we place it in parallel with the 2k resistor, but then it sees three times higher voltage, so it has to be one third as large! As a result, we need a 159nF capacitor in parallel with the 2k resistor. Of course in a practical circuit we would use the closest standard values, such as a 22nF capacitor for Cint, a 13kΩ resistor for Rprop, and a 160nF or even 150nF or 180nF capacitor for Rdiff. As you can see, now the phase for the whole range from DC to over 10kHz never gets closer than about 65° to the dangerous -360° limit. 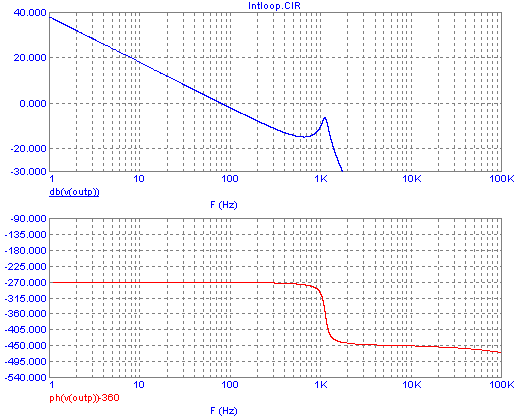 The phase shift problem caused by the low pass filter has been removed! Also the DC and low frequency gain is excellent, at medium frequencies the gain is still plenty, and life is good - except that a new resonance showed up at 20kHz! 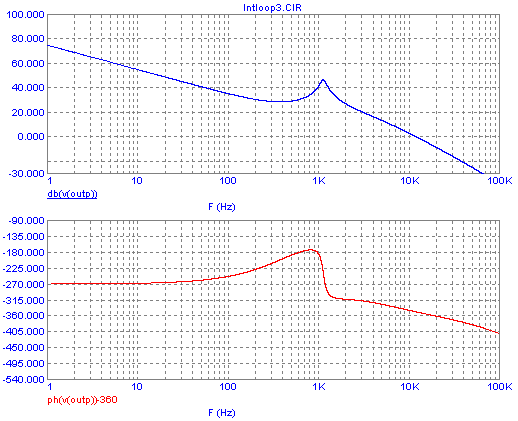 There the phase shift crosses the 360° line, and the total loop gain there is still high, like 40dB! That means: Oscillation! I think that roughly at this time you start realizing that control loop design isn't for the faint of heart, nor for people seeking instant gratification! Actually I'm not sure where this new resonance is coming from. It might be a quirk of the simulator, rather than a real effect, or maybe it's real indeed. In any case, it's happening at the frequency where the op amp reaches its limit, and a downward gain slope begins due to the op amp proper. Due to the differentiating function, and the relatively high starting gain at mid frequencies, at 20kHz the op amp is expected to deliver close to 100dB gain, which it isn't capable of. We could do two things: Either build the circuit for real, and try it, or first roll off the gain at high frequencies, where we don't need gain, really. The problem is that any gain roll-off at high frequencies means inserting a pole, which in turn means shifting the phase response 90° down. And that would bring us into oscillation land right away! So it looks like we need to sacrifice some overall gain. Much, much nicer! The resonance peak and its associated sudden 180° phase shift have gone away. But the -360° crossing happens at a frequency where we still have a positive loop gain. So we still get oscillation! Success! 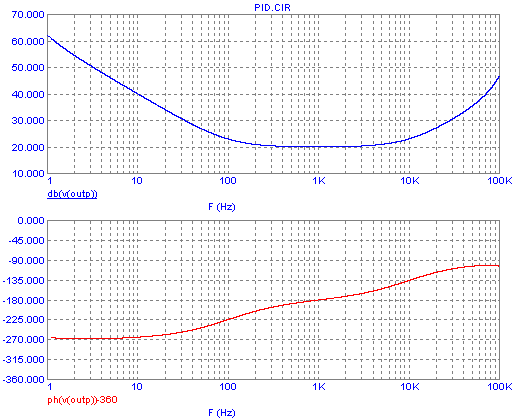 Now at the -360° phase point, we have -8dB gain, enough to satisfy the gain margin criterion. But... ouch! The phase margin criterion is not satisfied! At 0dB gain, we have very little phase margin! Math gurus say that they can start from the power circuit parameters, fill roughly 25 sheets of paper with integral calculus, enormous intimidating matrixes, a lot of small scribbling along the edges, and then come forward with the perfect component values for the error amplifier. The only problem is that in all instances I have seen them trying to actually do it, their circuits didn't work as calculated, and had to be tweaked anyway! At this point, we could simply solve the problem by reducing the gain even further. You see, this is like a mantra: If it oscillates, reduce the gain! 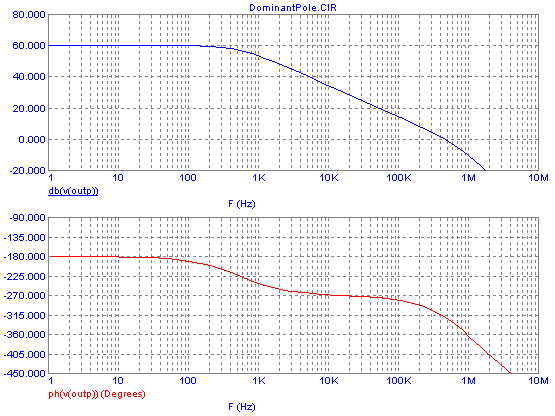 We would need to place the -6dB gain point pretty much at 2kHz or so, to just meet the phase margin requirement. But then we are back to having insufficient low and mid frequency gain! What we need is either a steeper gain roll-off without the associated phase lag, or else keeping the phase high enough up to a high frequency, where the low pass filter cuts the gain enough - but that phase boost would have to come without any additional high frequency gain! Both are wishful thinking. It seems that I cannot come up with a really good, fast, high gain, reasonably simple, and unconditionally stable control circuit for this simple voltage regulator!!! About the best I can do is slightly shift down the pole I had placed at 5kHz, and add an additional pole at a somewhat higher frequency, by means of adding a capacitor in parallel with Rprop. This is a so-called "Type-III" compensation circuit. I think I'm right on the money if I assume that by now you are just a little bit lost about the exact circuit configuration I'm talking about, so here is the schematic of the final circuit. It still has the PWM and driver shown only as blocks, but that shouldn't be a problem. Looking at it closely, you can see that the gain margin is about the required minimum 6dB, while the phase margin is a bit tight, barely 20°. So this circuit will have a tendency to ring at about 3kHz, but it should not self-oscillate. At the same time, its low frequency gain is high, so the voltage regulation accuracy will be good. In the mid frequency range, the gain is mediocre to poor, so any ripple on the primary supply will get through to the output, with a significant amplitude. Sorry, friends! It's all I can do. Now let me break some bitter news to you: All of our careful tweaking of this error amplifier was complete nonsense, and utterly useless, because the power circuit we were trying to control can only exist in Simulatorland! Because it uses perfect, lossless components. But the real world just isn't nearly as simple! Real components are imperfect. Capacitors have some Equivalent Series Resistance, which isn't negligible in circuits like this. 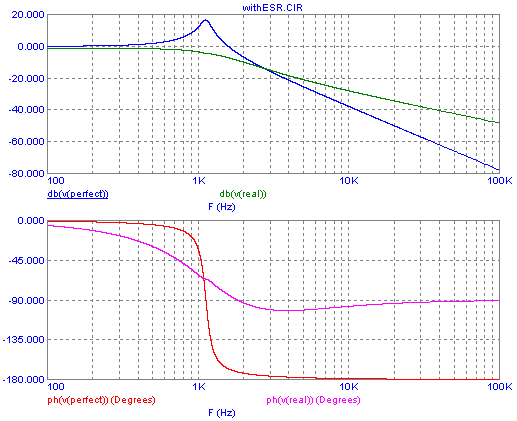 Inductors have a lot of ESR too, and what's worse, the ESR changes with frequency! At DC it's just the wire's resistance, but at several kHz and higher an additional resistance shows up, which is caused by loss in the magnetic core. And what's even harder to manage is that inductors are quite non-linear with current! Not only their ESR changes with current, their inductance also does so, and quite dramatically if you get close to the saturation zone! The consequences of this are two: The simple power circuit we were trying to compensate just doesn't exist in the real world, and what's worse for the virtual electronician, it's extremely hard to correctly simulate such a circuit in software! Regardless of how much effort you invest in getting your simulation right, the real circuit will still behave differently. You can only get close with the simulation, and how close you get depends quite a lot on sheer luck, because there are always some things you don't know about your real circuit. The level of agreement between electronic circuit simulators and the actual circuits is about as good as that of a 5-day weather forecast with the actual weather! To say it bluntly: Circuit simulators are liars in the same class as meteorologists! Both have the best intentions of getting it right - and both miss the mark by a wide margin! I tend to use simulators only for relatively simple cases, and when I know well enough what should happen, to make a reasonable sanity check of the simulator's output. For this article I'm using Micro-Cap, simply because it allows me to create nice-looking Bode plots. But when I have to design an actual control loop, I first measure the behavior of the actual, real, physical circuit. As you can easily see, the resonance peak of the filter has simply disappeared, and the worst phase lag caused by the real world filter is only about 100°, compared to the 180° of the theoretical, perfect filter! And each of these two differences helps us a whole lot in designing an error amplifier that provides enough mid-frequency gain along with good stability! At low frequencies we don't have significant inductance, and instead we have an RC low pass filter: 0.16Ω in series, and 1mF to ground. The pole frequency of this combination is 995Hz, and explains the first half of the phase response bend, and the inflection from constant gain to a -20dB/decade gain slope. At high frequencies instead the inductance dominates over its ESR, but the capacitor has become a resistor, so we have an LR low pass filter in that range! This explains why that range also has only a -20dB/decade gain slope, and only -90° phase shift. Only around 3kHz we have a mix of inductance, capacitance, and both resistances, so there we get slightly more phase lag than 90°, while the increase in the gain slope is barely noticeable, but present. At the "resonant" frequency neither the inductor nor the capacitor are pure enough to cause any noticeable resonance effects! If the ratios of ESR to inductance and capacitance were slightly different, putting the inductor's pole frequency right on the capacitor's zero frequency, we would get a clean first order response from this filter, meaning a very smooth -20dB/decade slope and a precise -90° phase lag, without any overshoot! The inductor would basically start filtering at a frequency where the capacitor stops doing so. The problem in doing this in practice lies in the poorly defined ESR of capacitors. Manufacturers will guarantee a certain maximum ESR, but not a minimum, and then the ESR changes a lot during the life of the equipment, going up as the capacitor ages. So it's always unsafe to rely on en electrolytic capacitor's ESR to stabilize a loop, but it's what almost everyone does in this trade! What can be done, to remove this uncertainty, is using very low ESR capacitors, such as plastic film or multilayer ceramic capacitors instead of electrolytics, and then deliberately adding some series resistance. Very often this can be done simply by using narrow, long circuit board traces! Where that introduces too much inductance, a very low value resistor can be used. And don't shudder thinking of a giant 1000µF ceramic capacitor! 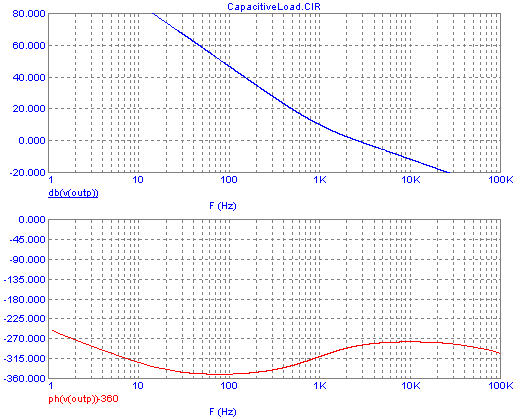 Modern high frequency switching systems often need suprisingly low values of capacitance. Let's get back to our humble voltage regulator. It's time to cook up a new error amplifier for it, now that we have a more realistic Bode plot for the filter's behavior! The logic will be this: The largest phase lag of the filter is 100°, at 3-5kHz. As long as the error amplifier doesn't introduce much additional phase lag, the circuit will be stable! But a simple integrator of course introduces 90° of lag, and that's not acceptable. So the simplest error amplifier circuit we could try is one having a single zero, behaving as an integrator at low frequencies, and as a proportional amplifier at middle and high ones. That would be a PI controller, or a pole-zero compensator, depending on the lingo you speak. Pole-zero is because in addition to the zero you introduce deliberately, there is the natural pole formed by the op amp running out of open-loop gain at extremely low frequencies. To have the error amplifier introduce little phase lag at 3kHz, we need to place the zero well below that frequency. I will try 1kHz. And then we have just one more decision to make: The overall gain. How much we can use depends on the high frequency response of the op amp, because as it runs out of bandwidth it will naturally turn into an integrator, inserting a pole, causing a -90° phase shift, and at that point the total loop gain needs to be low enough. 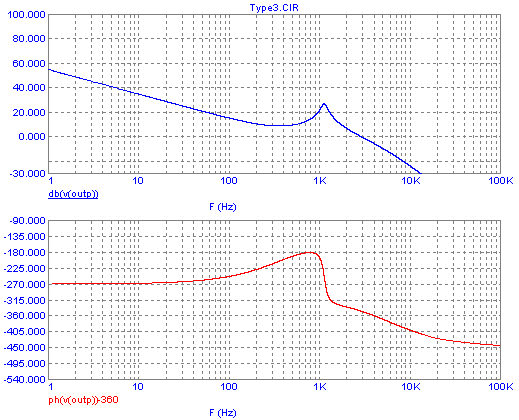 Given that I'm using a pretty good LF400 in my simulation, I will shoot for 40dB proportional gain. This means: From very low frequencies to about 1kHz the low pass filter has flat response, while the error amplifier slopes down by 20dB/decade, from the op amp's open loop gain to 40dB; while from 1kHz upwards the low pass filter is the one that slopes down at that 20dB/decade, while the error amplifier has constant gain! 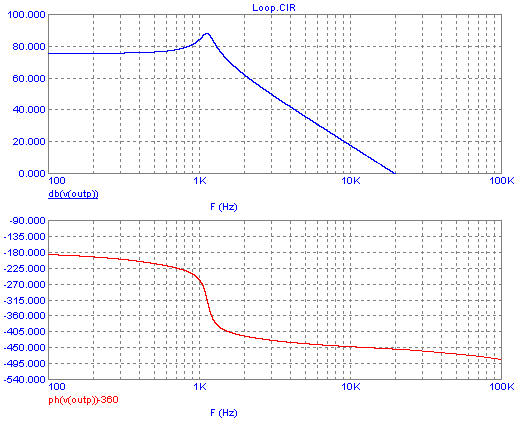 The result should be a nice smoothly sloping gain curve, along with an acceptable phase response. It's pretty nice! The phase margin is around 55°, which is fine. The gain margin can't be seen in this plot, as the phase lag of 360° occurs at a much higher frequency, but the shape of the curves seem to show that the gain margin will be ample. The gain at 100Hz (grid ripple frequency!) 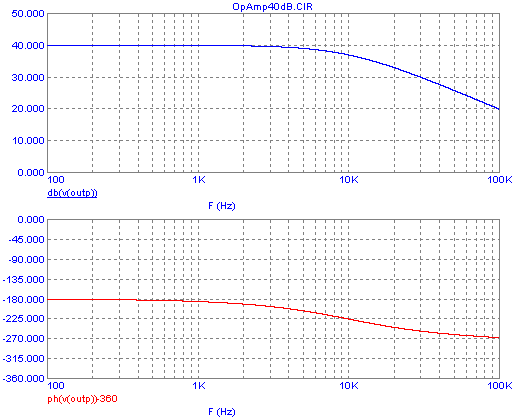 is 70dB, which will afford a very good ripple rejection. DC gain is basically the op amp's open loop gain plus 20dB for the power circuit minus 10dB for the voltage divider, which assures a very precise regulation (as long as our zener is good, that is...). All is fine, and this circuit should work well. Do you agree? In fact many switching regulators use simple PI error amplifiers like this one. It tends to work well in practice - thanks to filter component imperfections! If I needed to deliver a design from which a company would make one million units, I would invest some further effort, though. For example, optimizing the inductor's pole frequency and the filter capacitor's zero, by picking optimally suited parts, and fine-tuning the error amplifier's zero frequency, to iron out the phase depression that remains around 2.5kHz. This circuit can still be improved a lot. But there are more fundamental issues left to consider, before we invest any effort in fine-tuning anything. And that brings us to the next section! Do you know what a user is? Probably not really. It's a contraption, usually of human nature, designed and programmed to do all kinds of unexpected, weird and crazy stuff to the equipment you have so carefully and lovingly designed! It's well known in the trade that users are not shy of placing direct, very real short circuits across the outputs of power supplies, and that's why every designer who knows users will include a good, effective short circuit protection scheme in each of his designs. But that just barely scratches the surface! Users will think nothing bad about running a power supply without any load at all, or with a very light load. Why should they suspect this is a problem? Rarely will users load a power supply with a nice, well defined resistor, as I have done throughout this saga. Instead they might use the power supply to power some electronic equipment, that has an internal linear regulator, and such equipment draws a constant current. That means, it has infinite input resistance! For stability effects, that's just as bad as running a power supply without any load - but with unknown, possibly intense and variable current being drawn! Even worse, many evil users will use a power supply to power some equipment that has yet another switching regulator in it. And switching regulators are nasty things - you should know that by now - and one of their nastiest characteristics is that they exhibit negative resistance at their input! The more voltage you give them, the less current they draw. Now if running a regulator like ours into an infinite load resistance is a problem, just imagine what will happen to stability if you run it into a negative load resistance! You can make an LC filter oscillate by connecting a negative resistance to it, without needing a control loop at all! Some users are more evil than evil! They will connect electronic equipment to your power supply, that has a big, good electrolytic capacitor at its input. This capacitor ends up in parallel with the capacitor of your low pass filter, and that's the bitter end to all the intense work you have put into optimizing the loop response! Because adding that external capacitance pushes down the resonant frequency of your low pass filter, totally changes its characteristics, and only Tesla knows what will happen to your loop! Do you know who the superlative exponents of evil are, in this regard? Golden-eared audio fans! Of course, I have to say in their defence that most of them wouldn't ever use a switching power supply to power any of their ultra delicate, oxygen-free-copper-cabled, 0.00000000001% distortion audio equipment. But if one of them should try to do it, he will certainly "improve" your power supply by planting a big, 10 Farad (at least) supercapacitor across its output, to provide the "reservoir" capacitance he believes his power amplifier needs for those crunching bass notes. Now imagine what that does do your low pass filter's characteristics!!! And still these audio fans are not the absolutely most evil users on earth. Can you imagine who is even worse? Probably not - but I have witnessed them: Car owners! And do you know why? Well, watch any car owner who needs to drive from here to there now, proudly jumps into his shining car, turns the key - and nothing much happens, due to a flat battery! Such a car owner is instantly turned into a Mighty Monster, desperately looking for anything that will provide his beloved car the dearly needed 12 volts at umpteen amperes, to get it running. If another car with a good battery and a set of jumper wires are nearby, your are safe, so relax... But if your 12V power supply is the suitable object nearest to this enraged specimen of the wheeled race, resignation is the only thing I can recommend - because your power supply will be connected directly to that battery! And if the golden-eared audio fan's 10 farad capacitor was bad enough, well, the average car battery behaves roughly like a 200,000 farad capacitor, with a 0.002Ω ESR! That for sure pushes your filter's resonant frequency into the millihertz range, and your gain margin becomes about -100dB! So, it looks like we need to consider the effects of load impedance on our circuits. There isn't any trouble in the high frequency range, of course - with such a big filter cap there just can't be any significant high frequency signal, right? But around 100Hz we have a terrible phase lag. As it is in this plot, the regulator will ring severely on any 100Hz signal - and that means that the grid ripple output with that big capacitor will be worse than without it! Our audio fan wanted to do good by slapping the big capacitor on the power supply, and what he got instead is bad hum! Don't forget that my simulation is very basic. In a real circuit, there are several elements providing some additional phase delay. It's likely that in this case those additional delays would be enough to reach 360° phase lag, and then the power supply would break into self-oscillation at roughly 100Hz, as soon as this big capacitor is connected to it! To make a power supply more tolerant of such abuse, we need to bring its phase response closer to the optimal -180°. Ours is at or below -270° over the entire spectrum, and that's workable under normal conditions, but not very tolerant of difficult loads. When a really difficult load is connected, such as a battery, everything depends on the ratio of "capacitance" to series resistance. A very good, new car battery that has a very low ESR can throw the loop totally out of stability, while the same battery after 2 years of use will have developed a much larger ESR, and will appear mostly like a resistive load to the power supply, causing no problem! A practical hint for evil car owners who see themselves unsurmountably tempted to connect a power supply to their batteries: Use a longish, not very thick wire. That might add enough series resistance to keep the loop stable! If you are gifted with a very good memory, you may still remember that very near the beginning of this article I told you that I would base the analysis on the regulator running in continuous mode; and that I explained briefly what continuous mode is. Well, a practical switching regulator will typically run in continuous mode only above a certain minimal load current. Below this limit, the inductor current will be discontinuous, and that opens a whole new can of worms! In continuous mode the average voltage after the power transistor is basically an amplified copy of the PWM's input voltage, the amplification factor being defined by the primary supply voltage divided by the PWM's input voltage range. But this is no longer true as soon as the load becomes small enough for the regulator to operate in discontinuous mode. Instead, the output voltage will then be the integral of the duty cycle: Its value will depend not only on the duty cycle, but also on how long it has been working at this duty cycle! At zero load, if given enough time the output voltage will climb to the full 20V input, regardless of how narrow the pulses are! The only way to stop the voltage from climbing under no-load condition is to reduce the pulse width to zero, that is, disable the pulses altogether. In terms of gain and phase this means that at reduced load the power stage's gain increases, and at zero load it has infinite DC gain and a 90° phase lag! This is bad news, as it makes almost any such switching regulator unstable at zero load. That's the reason why many manufacturers state a minimum load requirement for their switching power supplies, and prohibit operation at a lower or zero load. But this issue isn't really as bad as it sounds. And that's because the problem is self-limiting, in a way: If the loop tries to start a self-oscillation, it will try to alternately pull the output voltage up, and then push it down. Well, when it's trying to pull it up, the charging low pass filter capacitor takes a current and thus acts as a sort of load, thus reducing the power circuit's gain and phase lag and removing the reason for the instability. And when that stops, and the control circuit tries to pull the voltage down - it can't! All it can do is setting the pulse width to zero, thus preventing any pulses, and this effectively opens the loop, pushing the loop gain down to zero! So, instability does occur in discontinuous mode operation, but it usually doesn't have any really terrible consequences. If such a power supply is running at an extremely low load, you would expect the power transistor to conduct a continuous train of extremely narrow pulses. Instead it will conduct short series of brief pulses, interspersed with longish times of no pulses at all. Technically the control loop is self-oscillating, but in practice this causes no major problem. The output voltage will stay constant enough, because during those pulse groups the current delivered to the filter capacitor is still rather small, so it only charges by a small amount, and during the no-pulse times the voltage drops very slowly too, due to the low load. And that's why most designers don't lose much sleep over the problems of discontinuous mode operation! And yet it's better to avoid this instability, even if it's only for noise reasons: When the control loop is unstable, and the power stage runs in bursts of pulses, there are relatively strong audio frequency components in the current flowing through the inductor, and any transformer the circuit may have. In some cases this creates audible noise due to magnetostriction of the ferrite cores. 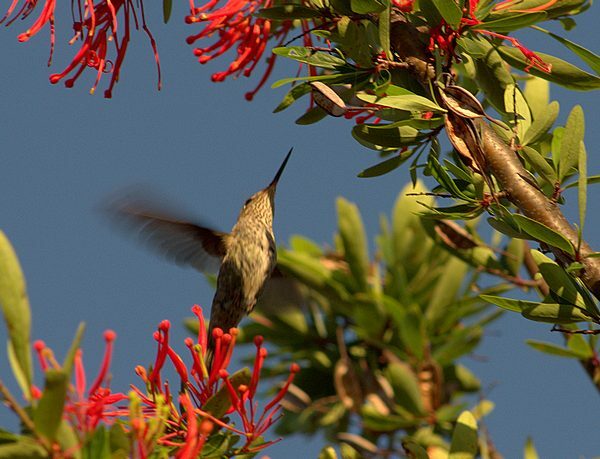 A rough, irregular hissing sound is typical. If you ever hear a switching power supply emit that kind of noise, you know that its designer didn't do a clean job! To allow better, faster, simpler control loops, it's sometimes a good idea to use current-mode control, instead of what's commonly but slightly misleadingly called voltage-mode control. Voltage-mode control is what our regulator above uses: Each pulse is started on time, at regular intervals, by a clock oscillator, and ended after another specific time determined directly by the error amplifier's output. In current-mode control each pulse is started exactly in the same way as in voltage-mode, but the pulse width isn't directly controlled by the error amplifier. Instead, the error amplifier's output is compared to a sample of the instant inductor current, and each pulse is ended when the inductor current has reached the value dictated by the error amplifier. So, the error amplifier directly controls the peak current in the inductor, and the pulse width ends up being whatever it needs to be to achieve that current. This difference has several implications. One is that the amount of current pumped into the output circuitry no longer depends on the primary supply voltage. That means, a current-mode controller automatically compensates for changes in the primary supply voltage, such as 100Hz ripple, without the control loop needing to care about it! This is called "feedforward". But an even larger advantage is that since the error amplifier is now directly controlling the inductor current, and thus the current delivered to the filter capacitor and the load, the phase lag caused by the inductor is completely removed from our loop calculations! We no longer need to care about it! That means that our LC filter now can never have more than 90° phase lag, and that both in the very low and in the very high frequency range it has zero lag! Note that the gain curve is the exact same as in voltage-mode control, but the phase lag doesn't ever reach even close to 90°, and returns to zero at high frequencies. The explanation for the phase curve: At low frequency, the capacitor is an open circuit, and we are just pumping controlled current into the load resistor. So, zero phase shift. At around 20Hz the capacitor starts becoming significant in parallel with the load resistor, thus causing some phase lag. But from 1kHz up, its ESR starts becoming significant, pushing the phase back up by making resistances dominate! The inductor, which caused a 90° lag in the high frequency range in voltage mode, cannot do so now, since we are controlling its current rather than a voltage applied to it. But the inductor stays fully effective in filtering the 50kHz switching frequency, keeping the transistor current from spiking, and storing energy. 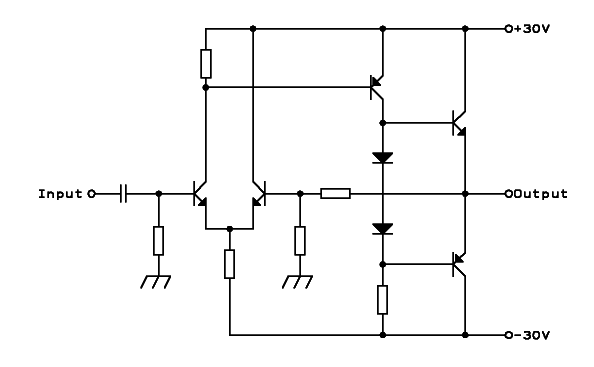 Designing an error amplifier for a current-mode regulator is trivially simple. A PI circuit with its zero placed at a somewhat lower frequency than that of greatest phase lag works very well and is quite uncritical. In some cases a plain simple integrator works well enough, and that's often seen in power supplies using simple control-mode ICs such as the UC3842. I have also successfully used simple high gain proportional amplifiers, which eliminates the low frequency phase lag of an integrator, and thus avoids the problem of low frequency instability when a battery is connected to the output, shifting the filter's frequency way down. With a proportional amplifier, it's good practice to add a small feedback capacitor to limit high frequency gain, to reduce jitter. That means, place a small capacitor in parallel with the feedback resistor, calculated to give a pole at maybe one tenth the switching frequency. The resulting phase lag at high frequencies is almost always well within the healthy range. 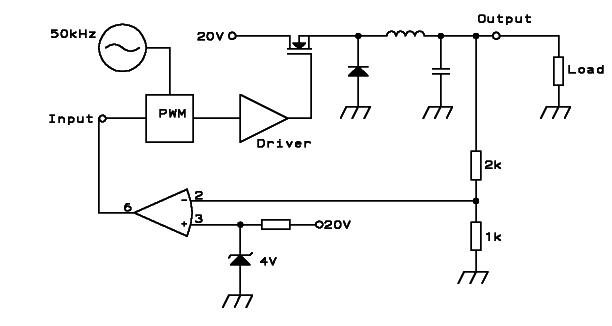 The gain of the power section in a current-mode regulator depends on the load resistance. The higher the load resistance is, the higher is the gain. As the load resistance goes up, also the pole formed by it with the filter capacitor goes down in frequency. At no load, this pole can sit in the millihertz range, causing the -90° shift region of the low pass filter to extend into that very low frequency range. And the gain tends to be extreme. For this reason, an integrating error amplifier, which adds another 90° of phase lag, can easily make the loop unstable, and so it's undesirable in ciurcuits whose loads may become very light. Instead a proportional error amplifier works fine, because at no frequency the low pass filter adds more than 90°lag, so that with the lag-free proportional amplifier we can use essentially any gain we want, without risking instability! In the high frequency range, our proportional error amplifier will naturally degrade into an integrator, and cause 90° phase lag. Its pole frequency will depend on the characteristics of the op amp used, and the gain we have programmed: Lower gain, higher pole frequency. As long as the pole frequency is high enough for the error amplifier's phase lag to fall into the range where the low pass filter capacitor's ESR has pushed the filter's phase lag back near zero, there will be no risk of oscillation. To avoid excessive pulse width jitter, it's a good idea to avoid unnecessarily high error amplifier gain at the circuit's switching frequency. Depending on the op amp we use, and the proportional gain we program it for, we might need to deliberately reduce its pole frequency. This is done by adding a small feedback capacitor, in parallel with the feedback resistor. The pole frequency of course will the one at which the chosen capacitance has a reactance equal to the feedback resistor's value. As you can see in the UC3842's datasheet, a 3V change at the output of the error amplifier will make the peak current vary from zero to its maximum possible value. This maximum value is set by a 1V internal limit, and internal 1:3 divider, and the external sensing resistance. I used 0.33Ω, so that the maximum current possible is 3A. This means that the pulse width modulator of this current-mode IC, in my configuration, will have a transconductance of one ampere per volt, very easy to remember. You need to be aware that the current we are controlling here is the peak current. The average current will be lower. How much lower, depends on the component values and the current level at which it is operating. If the inductor is working in continuous mode, and with a high DC current and low AC ripple current, the average current is almost the same as the peak current. But as the current becomes lower, due to a lighter load, the ripple current in the inductor stays constant, while the DC current gets smaller. So, the average current becomes smaller relative to the peak current. This becomes extreme when the inductor operates in discontinuous mode, and the average current can become a small fraction of the peak current. So, the real transconductance of this contraption is nonlinear, and generally increases with current! Let's take the highest possible current, which produces the highest gain. In this circuit, the average current will then be around 0.9 A/V. Since at that level the equivalent load resistance offered by the motor will be around 60Ω, and the current 2.7A (as you can see, I cheated a little bit when calling it a 3A supply! ), the voltage will be 160V, caused by the 3V at the error amplifier output. This means a power circuit gain of 35dB. Such high power circuit gains are typical for high voltage regulators controlled by low voltage circuitry. The feedback circuit starts with a reflex circuit that transfers a voltage sample from the positive to the negative power rail side, necessary due to the particular layout of this buck circuit. 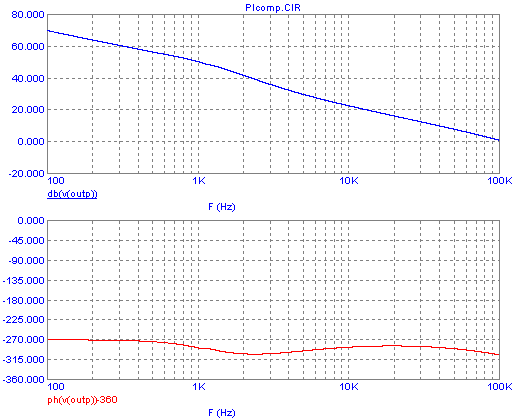 It has the same attenuation as the power section has gain, that is, 35dB. 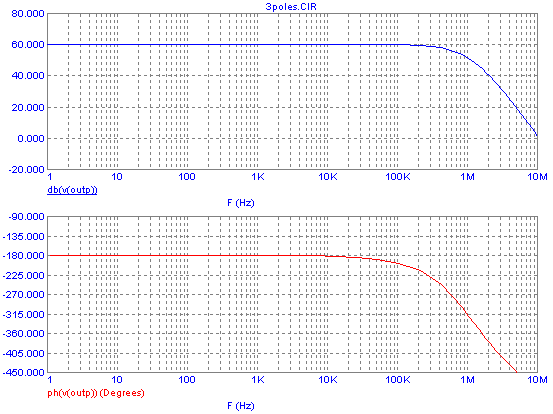 So they compensate, and the total loop gain is just the error amplifier's 30dB! While that may seem low, it's plenty for a power supply that feeds a lathe motor. What happens at lower currents? The circuit regulates the voltage to 160V, so that's a constant (most of the time!). At lower mechanical load the motor draws less current. At very low load, it draws only 0.2A or so, and the inductor operates in discontinuous mode. At that level, the average current is far below the peak current, meaning a very much lower transconductance between the error amp's output and the inductor current. At the same time, the higher equivalent load resistance has gone way up, increasing the gain at that place. The two efects tend to compensate each other to some extent, but the former is nonlinear and the latter is linear, so the compensation can never be complete. The good part is that thanks to the favorable phase response of this kind of circuit, in current-mode and with a proportional error amplifer, the loop is stable despite the highly variable loop gain. In this circuit there is an additional complication, given by the slope compensation introduced by Q2 and R5. It's necessary to achieve stability in this kind of circuit, but it interferes heavily with the power section gain calculation! If you want a good learning exercise, take the UC3842's datasheet, assorted application notes, a circuit simulator, and if at all possible an actual prototyping board and some components, signal generator and scope, and work your way through it! It will be worthwhile, I promise! Until here I have mostly neglected the effects of various parts of these circuits that cause additional phase shifts. And the fact is that almost everything causes them! In some cases they are small enough to ignore, since the loop gain crosses zero before the total phase lag gets to 360°, but in other circuits these additional phase shifts are so large that they become a serious problem. Let's start with the PWM. In addition to the delays of its internal circuitry, given by resistances, capacitances and even tiny stray inductances, that amount to perhaps a couple hundred nanoseconds, there is the significant delay of PWM action itself: Changes at the input are transfered to the output pulse length only when the next pulse trailing edge happens. This can be from "right now" to "one full cycle later". So there is an average delay of one half period of the pulse frequency, plus/minus another half period. This means that at the circuit's switching frequency it creates an average 180° phase lag, and at one half the switching frequency it creates 90° lag. Given that a pole creates a lag of 45° at the exact pole frequency, we could consider PWM time delay to create a pole at one quarter of the switching frequency, but it's not a nice clean pole, due to the statistical nature of this delay. Then there is some delay in the power transistor, like a few hundred nanoseconds, depending on its type. Let's forget that one. But a very important additional delay in some power supplies comes from an additional filter stage. Many switching power supplies are used in applications where the switching-frequency ripple obtained from a single stage low pass filter is not acceptable, and a second filter stage is added to suppress this ripple to an acceptable level. Depending on the component values of this a additional filter, its phase lag can be very bad and totally unacceptable for loop stability! The simple solution in such a case is to take the feedback sample from the point after the first filter, before the second one. But if high DC voltage accuracy is desired, the voltage drop through the second inductor might be a problem. In such a case the solution is taking the low frequency and DC feedback from the very output of the power supply, while taking the higher frequency feedback from before the second filter! I did this in my 13.8V 40A power supply, with excellent results. Novice designers tend to love optocouplers, without even knowing them very well. Sure, optocouplers are marvelously convenient when you need to transfer a signal while maintaining full electrical isolation. But street-variety optocouplers are horribly slow! There are some techniques to speed them up, but there is a limit. In a typical power supply feedback loop, the delay and mid-frequency phase lag caused by an optocoupler cannot be ignored, and their high frequency response can be nearly nonexistent! Faster optocouplers do exist, and can be used with far fewer problems. You just have to know it. As happens often in life, one's first love is not necessarily the most convenient one! Alternatives to optocouplers do exist. In some cases a transformer can be used to transfer a signal over an electrical insulation, but when that signal includes DC, as it usually does in a power suply, it needs to be modulated on a carrier, and that adds complexity - and isn't free from delay either! Another method often used in power supplies with uncritical output stability specs is sensing the voltage on the main transformer, and relying on reasonably good coupling for the output voltage to follow the sensed one. This tends to work better than many people imagine, and is extremely simple and inexpensive. Simulation and theoretical analysis of complicate circuits is very prone to errors and omissions. Nothing beats measuring the actual behavior of the real, physical circuit! A good way to do this is opening the loop by disconnecting the output of the error amplifier from the PWM, applying an adjustable voltage level to the PWM to make the circuit operate at roughly normal conditions into a load, and injecting an small-amplitude AC test signal to the PWM. The phases and amplitudes of the test signal at the input and output of the power circuit are compared, to determine the gain and phase shift. This is done at enough different frequencies throughout the spectrum, to obtain a good idea of the power circuit's behavior. A Bode plot can be drawn from this data. The exercise should be repeated under several different strategically chosen operating conditions, such as full load, no load, mid load, current limit, etc. Specialized, multithousand-dollar test equipment is available to do this automatically, but it can be done easily at home, using nothing more than a computer and a few resistors. Even a basic computer sound system covers the spectrum to at least 20kHz, with about 80dB dynamic range, in stereo. That's plenty for analyzing most practical power supplies, although some of the newer, ultracompact, relatively low power units tend to run at such a high switching frequency that they need analysis up into a frequency range a simple computer sound system doesn't cover. Anyway, to use a computer for this task, you first get free software that allows generating signals, and you use it to create a test file (WAV-PCM format is fine, don't use any lossy compression like MP3), containing short bursts of sine waves at many different frequencies throughout the spectrum. Start at the lowest frequency the sound system can work at, typically a few Hz, and go up, for example, in half octaves. Then connect your computer to the device under test, so that the line input connects with one channel to the PWM input, and the other channel to the power circuit's output, or if applicable you can include the optocoupled feedback circuit in the test - just leave the error amplifier out, and include everything else. Use the proper resistive dividers to get signal levels compatible with a soundcard's line input - around 1V is fine. Connect one channel of the soundcard's line output (headphone output is OK of course) through a suitable capacitor to the PWM input, and also connect a potentiometer there, with its ends connected to ground and the regulated reference of your circuit. Put the desired load on the output, and adjust the potentiometer from zero up to get a normal output voltage. Then play your test file, while recording the line inputs to a stereo WAV file. Of course, use the sound system's highest sampling rate and resolution. Then you can sit down and use any audio editing software to look at the recorded stereo waveform, compare the amplitudes in the two channels at each frequency, applying your voltage divider ratios, to calculate and plot the gain curve. And then you can time the zero crossings of the signals in both channels - many sound editing programs allow you to time them very accurately and easily - and you can calculate the phase lag (or lead) at each frequency from this, and draw the phase diagram. And there you have your real Bode plot for your circuit, which allows you to tailor the perfect error amplifier for it, using the insider knowledge you gained reading this page! Just be sure to do the measurement at several load conditions, and design your error amplifier for the worst case. In addition to giving your error amplifier a suitable gain and phase response, you also need to consider what it will do in the presence of large signals. Sure, under normal, ideal operating conditions, all AC signals going through the error amplifier will be small. But every circuit sometimes goes into abnormal operating conditions. That's the case, for example, the moment after switching it on, when the output is totally off the correct value, because there hasn't been enough time yet to charge the filter capacitor. A similar situation happens the instant something with a big capacitor in it is connected to a power supply: The discharged capacitor causes a severe drop of the supply's voltage, which first has to charge that capacitor to normalize the voltage. There are at least two bad things that can happen in such a situation. One is that your choice of component values isn't right for the drive capabilities of the op amp. For example, if you use a 10Ω reference resistor and a 100Ω resistor to get a gain of 20dB, and the op amp works over a 5V range and has a drive capability of 1mA, you are in trouble, because it can drive that 100Ω resistor only over a 0.1V range! If the circuit is a PI compensator, so that you have a capacitor in series with that resistor, it will be fine at DC and low frequencies, but if a large high-frequency signal happens, you are still in trouble. While the op amp is in saturation (voltage or current saturation), the loop is essentially open! So you need to make sure that your feedback impedance values are high enough, so that the op amp can drive them over the full output voltage range, even at the highest frequencies that will be present. On the other hand, these impedance values shouldn't be higher than necessary, because switching power supplies are noisy places, and high impedance circuits pick up noise much more readily. So, the best choice is to shoot for component values that give impedances near the low limit acceptable for the given op amp's driving capability. The other problem is having excessive error amplifier output range. It's a very bad idea to power the error amplifier from a ±15V supply, while your PWM has an input range of zero to 1V! Any condition that makes the power circuit unable to keep the output voltage just right will make the error amp's output soar way out of the PWM's input range, driving it to full width pulses, or zero width pulses, depending on the case. When the power supply's output finally gets to the correct level, the error amp will just only begin to slew back toward the correct range, and that takes time! During that time, the control loop is still open, the pulses are still at maximum or zero width, and the circuit's output will far over- or undershoot the desired voltage. So, make sure that the error amp's output is properly limited to just the PWM's input range, or very slightly more, by clamping its output or by limiting its supply voltage. If you use a well designed PWM control IC with its internal error amplifier, the IC's designer should have taken care of this. It never hurts to check, anyway, because several of the old, much used control ICs suffer from this problem! And if you cook your own, you have to design this right! Many voltage-mode PWM controller ICs, such as the LM3524 and the TL494, have twoerror amplifiers instead of just one. Since voltage-mode PWM systems have no intrinsic current limiting, they need it added, or they will blow up very easily. This is the function of the second error amplifier. It senses the current, using a low value resistor, a current transformer, or maybe a Hall effect sensor, and if the current is too high, it takes control of the PWM away from the main error amplifier, reducing the pulse width to keep the current from growing to a dangerous level. The two error amplifiers are wired together through diodes, or through open-collector outputs with a pull-up resistor. To achieve clean current regulation at a certain maximum level, the current error amplifier needs its own compensation network. But then it will normally sit there saturated, since the current is smaller than the limit, while the voltage error amp controls the PWM, and if suddenly a short circuit happens, the current error amp first has to slew down into range before it can take the control away from the voltage error amp! This means that precious time is lost, during which the current keeps growing, at the rate allowed by the filter inductor. In such a circuit it's necessary to carefully calculate how long the current error amplifier will take to kick in, worst case, and make sure that the filter inductor cannot saturate during that time (inductor saturation would make the current grow far more rapidly! ), and that the transistors, diodes, etc, can take this overcurrent spike without danger. The Safe Operating Area specifications of the components need to be consulted (and understood!) for this. Some designers are too lazy to do it, or even to invest time in understanding this matter, and as a result their creations tend to exhibit a rather explosive behavior. In the mentioned ICs there is only a single compensation output for both error amplifiers, so at least there is no way how the feedback capacitors for an error amp could be charged to an inconvenient value. In exchange the flexibility for creating special error amplifiers responses is slightly limited. 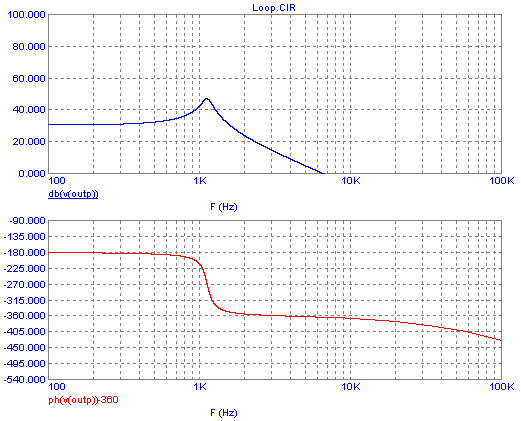 By the way, the error amplifiers of the LM3524 and the TL494 are very different. The former has a main error amplifier, which is a transconductance amplifier with very feeble drive capability, that's usually compensated with an RC network to ground, rather than a feedback network. 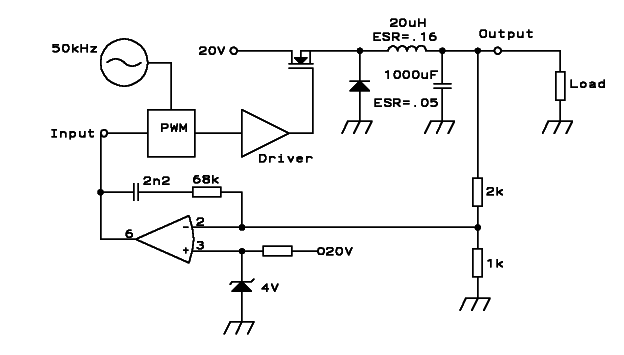 The current error amplifier instead is a very simple device, tailored for ground-level current sensing, with a built-in offset, that doesn't lend itself very well to the implementation of a clean, convenient response. The TL494 instead has two identical error amplifiers, which behave more like real op amps, but still have very small drive capability. Current-mode switching regulators are intrinsically short circuit protected, with the current limit acting within 200ns or so. For this reason they don't need a second error amplifier, and current-mode control chips normally don't have it. 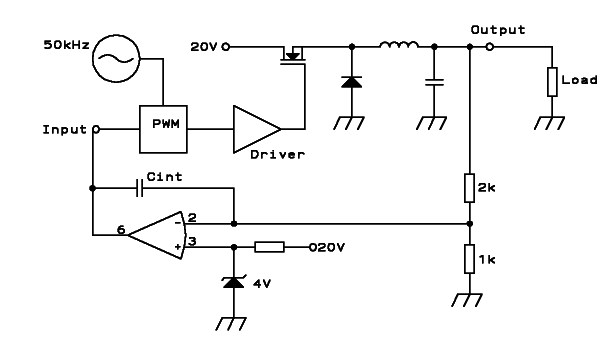 There is a differential input stage, that works as a comparator with high current gain. Then an amplifier stage that has both high current and voltage gain, and then a complementary power output stage that has just current gain. And from the output comes a feedback path to the input differential stage, applying strong negative feedback to the whole amplifier, thus giving it a known, frequency-stable gain, and a low distortion. Such an amplifier is also a plain and simple servo loop: The reference is the audio voltage applied to the input, added to the ground level applied through a bias resistor; there is an output that's normally applied to the speaker; there is a voltage divider providing a sample of the output, and a differential error amplifier. Such an audio amplifier could in principle be stabilized by applying the same recipe as for our voltage regulator: Open the loop, characterize the response, then design the error amplifier to provide a suitable gain and phase response to the overall loop. But this isn't very convenient in this case, because we have (and want!) a high gain in the "power section". An audio amplifier has another characteristic that's very different from a switching power supply: Typically it has far larger bandwidth than we need or want. So, while in the case of our voltage regulator we had to do some effort to get high enough gain into a high enough frequency range, but without making the loop unstable, in our audio amplifier a simple PI function seems ideal, because it will provide enough and uniform gain at audio frequencies, where we need it, and roll off the gain at high frequencies, where we don't want gain, to avoid RF noise pickup and strange behavior. But why would such an amplifier be unstable at all? There are no inductors, and no low pass filters, right? Well.... wrong! One problem is that the speaker is an awfully reactive load, providing a big inductance in some frequency ranges, and a big (motional) capacitance in others. The other problem is that everything in electronics has a limited frequency response: Just go high enough in frequency, and stray capacitances, inductances, and the effects of finite propagation speed will cause a pole (or two, or three...), introducing phase lag and reducing the gain. At 1MHz the gain is down 9dB down (3dB for each pole), and the phase lag introduced by the poles is 135° (45° each). At the critical frequency, where the total phase change is -360°, we still have over 40dB of gain left! So, we have again managed to build an oscillator instead of an amplifier. As you can easily see, the gain margin is now about 10dB, and the phase margin is very close to 45°, so the circuit should work fine. If you prefer a slightly larger phase margin, just move the pole down to 400Hz instead of 500Hz. This is called dominant pole compensation. The pole we shifted down is called dominant not because it's ferocious, cruel or tyrannic, but simply because it has the lowest frequency of all poles, by far, and thus dominates the behavior of the whole amplifier! The most practical way to implement this dominant pole compensation is usually adding a properly calculated little capacitor between collector and base of one specific well chosen transistor. The one we choose would typically be the one with the highest voltage gain, and that's the driver stage in our simple circuit. In circuits where there are poles on significantly different frequencies, normally the lowest pole is chosen, and lowered even more. In many cases the lowest pole is naturally in the stage that has the highest voltage gain. And in amplifiers having many stages, you need to place the dominant pole in one of the first stages, because otherwise a later stage might saturate from large high frequency signals, before the stage with the dominant pole has a chance to shrink that high frequency signal to its due size. Looking at the Bode plot, you might argue that now our audio amplifier is crappy, because its gain is flat only in the deep bass range, and then starts sloping down! If you argue that, you are forgetting that we are talking about open loop gain here. An audio amplifier is typically driven from about 2V rms, and being fed by ±30V, the absolute maximum undistorted output it might deliver is close to 20V rms. So it needs only 20dB of voltage gain. 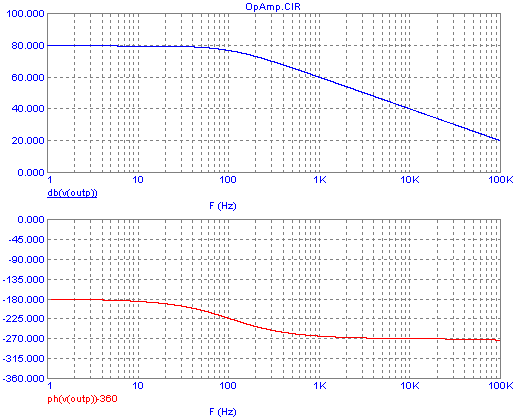 Looking at the gain plot, you can see that the open loop gain stays above 20dB up to 50kHz. When we now close the loop, by means of the proper feedback resistors, to give the amplifier 20dB gain, we will get this 20dB flat gain from the deep bass up to about 20kHz, where the curve will start bending down. And that's optimal for an audio amplifier! Nothing more needs to be done. There is an implication, though. 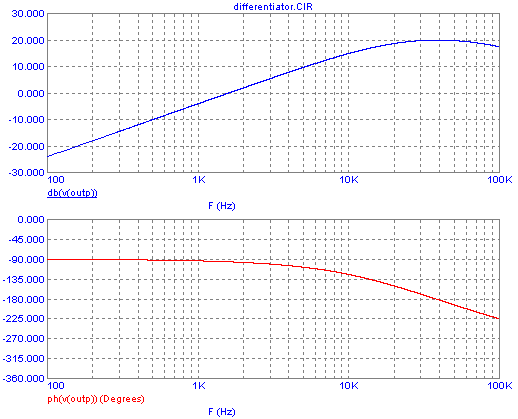 In the deep bass range we have 40dB excess gain, which will act through the negative feedback to reduce distortion. So our amplifier will have very low distortion in that range. But higher up in the spectrum the gain excess gets smaller, and so the distortion will rise. In the treble range there is very little excess gain left, and so the amplifier will have almost no distortion correction from negative feedback there! This is a characteristic of almost all audio power amplifiers: Rising distortion toward higher frequencies. Now you know why this is so. The good news is that modern transistors have extremely high frequency response, so that it's easy and cost-effective to make amplifier stages that have their first poles much higher up than 1MHz. This allows placing the dominant pole higher too, and this gives considerable excess gain even at 20kHz, which is then shaved off by negative feedback, and thus used to provide low distortion throughout the audio spectrum. Pure-blooded, slightly esoteric HiFi amplifiers typically break away from the dominant pole compensated, overall-feedback scheme, and use local negative feedback in each stage. But that would be material for another web page. This one is getting long enough as it is! It's worth mentioning, anyway, that most op amps are stabilized by the dominant pole method. The single compensation capacitor is internal in most op amps, but in some it has to be added externally, and in many others only the minimum acceptable value is provided internally, and the relevant connections are brought out to pins, so that the designer can add additional compensation capacitance when necessary. - Temperature controllers: The defining characteristic in them is that usually they are extremely slow, due to the long thermal time constant of the object or room whose temperature they control. You cannot easily make a PID controller for a home's heating system using an op amp and a few resistors and capacitors, simply because the extremely slow response required would call for tremendous capacitances, enormous resistor values, along with impossibly low leakage! One option in this case is to use a plain proportional controller, allowing the temperature to vary within a small tolerance range. If the sensor is placed very close to the heater, that will work, but the temperature in the room might not be well controlled, because of the thermal resistance between the heater and the area of the room where you will sit (and freeze or sweat), and the thermal losses of the room. If instead you place the sensor where you will be sitting, you get a long delay between the heater and the sensor, which adds to the delay shown by the heater in reacting to increased power input. The sensor itself takes a while to react to changing air temperature. So there you have a three pole response, causing a total -270° phase change between ultra low frequency (hours or days) and what would be high frequency for a thermal system (0.05Hz or so), and as a result the system would be unstable, basically driving the heater fully on and off and making the actual temperature go up and down a little around the set point. Most simple room heating thermostats actually work like this. If you want a really stable temperature, you do need a real PID, or at least a PI. But the very long time constant forbids the use of analog circuits, so what you need is a PID controller implemented in software. This allows implementing ultra slow PIDs very easily. A tiny microcontroller costing less than one dollar can easily manage this task. - Industrial robots: Usually these have several axes of movement, and each needs to position very precisely, and move as quickly as possible between one position and the next (time is money! ), but without exceeding certain acceleration limits. Usually this requires a double nested control loop for each axis: There is a position sensor (could be an optical encoder) feeding a PID controller that also might have some extra functions, usually implemented in software, that outputs an analog velocity signal. This signal is taken as reference by a conventional error amplifier implemented with analog components, that also reads a speed sensor (tacho generator) mounted on the motor that moves this axis of the robot. 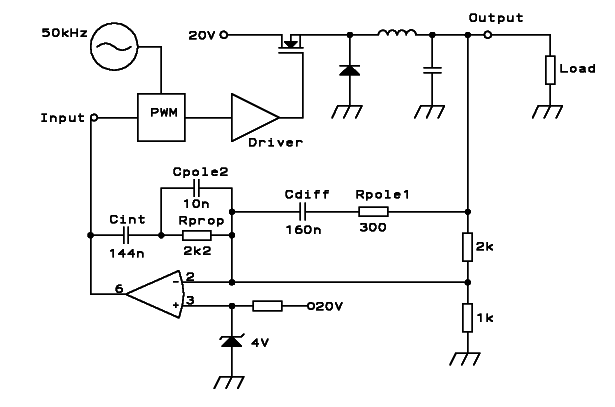 This error amplifier drives a power circuit, typically a PWM system, that powers the motor. So we have an inner velocity loop, controlled by an outer position loop. The position loop does the fine steering, the acceleration limiting, etc, at a relatively slow scale, compatible with software processing, while the inner analog velocity loop just performs the single task of making the motor move at the exact speed commanded at any time, regardless of load, accurately and fast. Look for any videos of car manufacturing plants, for example, and you will see what I mean. - Autopilots: In small boats, these typically use an electronic compass to sense where the boat is pointing, compare this to the desired course, apply the error to a PID controller, and send the result to the tiller motor in the form of timed on/off pulses. In slightly larger vessels, there is an additional position sensor on the rudder, so we have two nested control loops: The outer one reads the compass and decides the required rudder position, and the inner loop reads the rudder position and controls the rudder motor to get it right. In real ships, there is yet another, "more external" loop, using a GPS or other navigation equipment as input device. This master loop compares the actual course to the desired one, and decides where the boat should point. Then the other two loops act, the middle one reading the compass and deciding rudder position, and the innermost one actually controlling the rudder. This allows compensating for side wind and currents, while maintaining stability. And sailing yachts typically also have wind vanes and anemometers providing a input to the autopilot, which can then steer the yacht to sail at the optimal angle relative to the wind. Aircraft autopilots are far more complex, because they control at least four axles: Elevator, ailerons, rudder, and throttles. They get input from the altimeter, variometer, pitot tubes, gravity sensor, compass, inertial navigation system, GPS, landing aids, etc. However complex they may be, the principles in them are the same as for the humble voltage regulating loop: There is a system that needs to be characterized, and control loops need to be designed that provide unconditional stability along with sufficient response speed and accuracy. - Quadcopters: These are beautiful examples of control loops in action! The inputs come from several accelerometers, an altimeter, often a GPS, sometimes a variometer, a compass, and pilot input over the remote control link. The outputs are just four: the speed of each of the four propellers. The machines can do absolutely every maneuver, such as climbing, sinking, going forward and back, left or right, and rotating, by controlling just those four rotation speeds. - Steam engine governors: They might be a little antique, but they are a good example showing that control technology did not start with electronics. 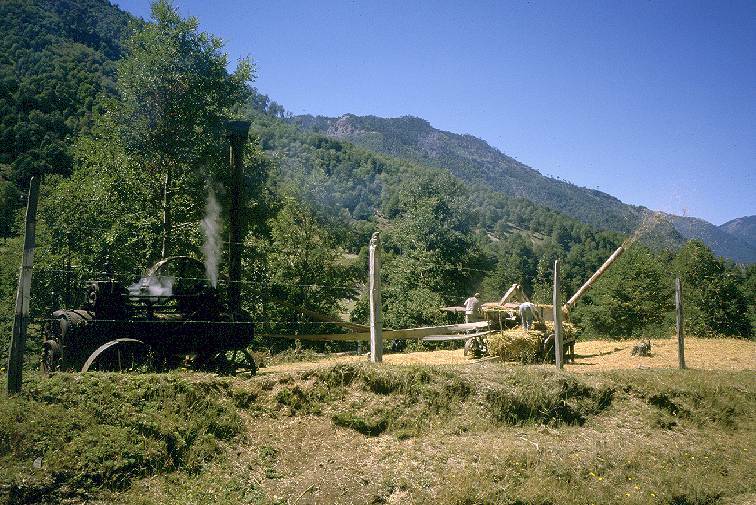 Maybe you have seen old steam engines, like the "portable" engines used on farms and sawmills around 1900, that have a mechanical device spinning on top, consisting of two metal spheres rotating on swing arms. The rotation is driven by the steam engine, through belts or chains or gears, and the centrifugal force pulls the spheres out, against a spring. This motion is transferred to a steam valve, that controls the power of the engine. The centrifugal force and the spring make for a proportional control action, with inertia adding a pole to avoid valve chatter (oscillation). Some of these governors include a double spring and lever mechanism, that adds a zero too. The result is impressively stable! I have seen such steam engines run at a highly constant speed, while driving a dramatically variable load. Only the amount of vibration, rumble and steam exhaust changes with the load.